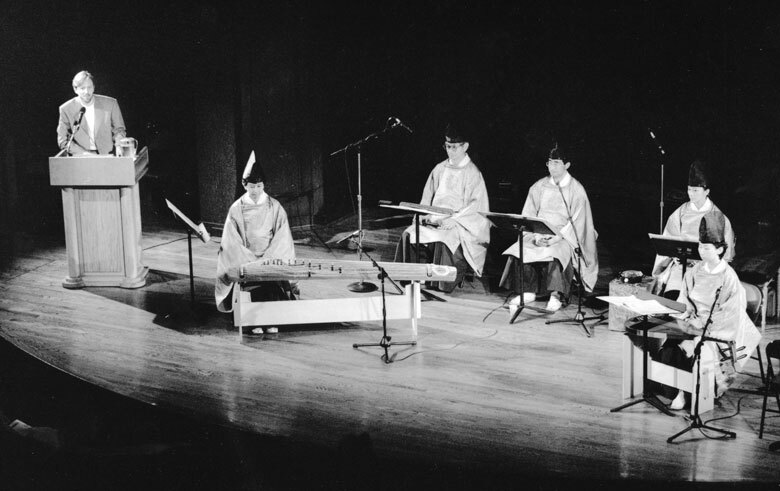 In 1996, as part of the inaugural Lincoln Center Festival, MFJ and Lincoln Center collaborated to produce a lecture/demonstration and symposium on Gagaku music. The demonstrations and performances centered on Reigakusha, a Gagaku ensemble from Japan led by Sukeyasu Shiba. On July 25th, at the New York Society for Ethical Culture, Gagaku expert Steven G. Nelson delivered the lecture “Gagaku in the Present and the Past: Toward an Understanding of its Historical Change.” Members of Reigakusha joined him for demonstrations and a performance of the classical Gagaku piece Goshoraku no Kyu. Two days later, on Saturday July 27th, MFJ and Lincoln Center hosted a symposium called “Gagaku in the Flow of World Music.” Sukeyasu Shiba was the keynote speaker, and US composers William Duckworth and Lois V Vierk joined him for a panel discussion that followed. Mr. Shiba’s Two Masks was played by Reigakusha members.